This is all public-domain stuff, and is not proprietary to any companies. Attached below is a portion of a letter which I wrote to some of the Lunar Rover and Apollo designers, and am awaiting feedback and forward planning for the next reunion. Attached also is an partial design drawing of a lunar wire-frame wheel (approx 600Kjpg). You are free to publish this drawing, for comparison purposes. This was recorded as a 300dpi BMP, but cut to 100% JPG format, to reduce size. As we speak, Sam Romano and Ferenc Pavlics are being filmed for a TV series presentation of the Space Program. I was able to verify from my own material, that there was indeed a Hayes International Corporation, which presented to NASA at November 1964. Eduardo San Juan was undoubtedly the same person mentioned in your recent posting, of a proposed Lunar Rover. Unfortunately, as per the text below, many other companies had already offered similar competitive concepts, as we GM-DRL also did. Competition was exceedingly tight in that era, and we won the competition mostly because we were able to deliver the vehicle in such a short time-frame. The LSSM final report, published in July-1966, lists forty-seven (47) different configurations which were proposed and analyzed, before a final decision was made by NASA, as to which one would be built for the actual ascent. We had been doing extraterrestrial vehicular prototyping all the way back to the mid-50’s, via M. G. Bekker’s work, and had a significant knowledge advantage over the competition. The Army Ballistic Missile Agency (ABMA) 1959 proposal was actually based off some of Bekker’s “floater” work, with the Balute wheels. At that time, the composition of the moon was not actually known, and various researchers were proposing that it consisted of anything from hard-solid rock, to styrofoam-like surfaces of vast porosity, including the fear that an Astronaut would literally sink-in over his head, and going all the way out to “frozen-free-radical” chemical surfaces, where the Astronauts shoes would either dissolve or explode, as soon as he stepped down. It was not until the Soviet LUNA probes (proposed circa 1955, development started circa 1958, attempted failed launches 1963-65, hard-smashed into the moon in 1965, and finally soft-landed Luna-9 in Jan-Feb-1966), that the actual lunar composition became known. The Soviet television and radio-data material was ridiculed over here, as being partially faked, because many Americans did not want to believe they had been beaten to the moon. This material, however, clearly showed the actual compositional density and strength of the lunar soils, which demonstrated that a tractive vehicle could easily pass over the moon’s surface. After American probes dug-up some local moon surfaces, and measured the resistance forces, fracturing characteristics, size of grains, etc, did an actual dirt-like-mix composition start to evolve. By the time the actual LRV was designed, we had replicas of the moon-dirt delivered to us, as generated from NASA data material, and ground up by contracted dirt-works and quarry companies. NASA delivered this real-fake-simulated dirt, to any participants in the LRV competition, and we used it in vast quantities in the M-over-4 (M/4) testbeds. I remember spending many hours running the breadboard motor-controllers, running over simulated moon-rocks, and watching the wheels get banged up. There was dirt and and general moon-crap all over the various labs. Outside, in the back of the front building of our plant, we had an actual moonscape, which was used for whole-vehicle testing, using a 1G-sized trainer. We also had a very large vehicle test-track in the way-back portion or our site, which was an Army Tank and Truck track. This had multiple hills, water and mud pits, and sloped surfaces for huge-vehicle testing. At first, the 1-G Trainer wheels were actual rubber tires, which we bought down the street at a local car-parts dealer (may have been the start of DalPozzo), and had the tread ground-off at a local grinding shop. This was to simulate the expected traction, that the true wheel was going to have on the moon. Since the moon is at only one-sixth of earth-gravity, the traction values were expected to be much lower. The rubber wheel essentially ended up being a “baldy”, and had really bad traction on any kind of earth dirt. As a result of this kind of extensive testing, the actual Lunar Wheels worked very well, and actually had pretty good traction. There are two NASA videos which show the performance under both low-speed and high-speed driving. If you look closely at these, you will see at least one scene, where the LRV actually lifts off the lunar surface. In other scenes you can see the skidding parameters, and the dirt-pumping of the wire-wheels. The wheels actually imbed partially into the soil, and would sink quite low, if not for the floatation offered by the highly evolved chevron and bumper design. Get hold of these videos, and post them for others to see. There is a yearly NASA moon-buggy competition (in Huntsville), which attempts to get modern kids up to our speed, but as you will see, we were way-ahead of them, and way-way-way-above them. Attached below (approx 600Kjpg) is one of my earliest verifiable records which shows a partial view of an actual Lunar Rover airless wheel design. This scan is from a PDS study titled “Apollo Logististics Support System (ALSS) Payloads”, prepared by GM Defense Research Labs, for the Boeing Company, under NASA prime contract NAS8-11411. For this study, eight different wheel designs were evaluated, one pneumatic, and the other seven airless, during a program which ran from about 1962 thru 1964. If anyone has any other earlier material, please let me know, or Sam Romano and Ferenc Pavlics. I have other reference LSSM report material which indicates that the earliest actual “proposed” LRV was a 4×4 configuration made by the Army Ballistics Missiles Agency, circa 1959. Aerojet presented a Spacesuit-imbedded-in-Vehicle in 1961. Grumman published a report at about same time, which showed stowage and space-availability concepts, in which a vehicle was also shown. GM-DRL made a presentations to NASA headquarters in 1962 and 1963. Much other subsequent study and proposal material followed in the 1963 and 1964 and 1965 timeframes, from the Aerospace, Bendix, Boeing, Grumman, and Northrop, companies. Later studies were added by the AMF, Chrysler, Hayes, Hughes, Lockheed, and Tinsley companies. Several other commercial organizations, such as magazines and newspapers were also writing-up various speculative articles, all during this era. In this particular Molab/LSSM study, there is also a mention of the Flying Lunar Rover (FLV) concept, to which I have no other references, except some magazine material which von Braun apparently published circa 1953-54. 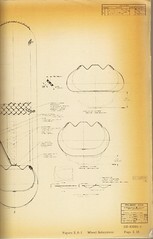 I have never seen any conceptual drawings of the Flying Rover, and would like to obtain any such material. 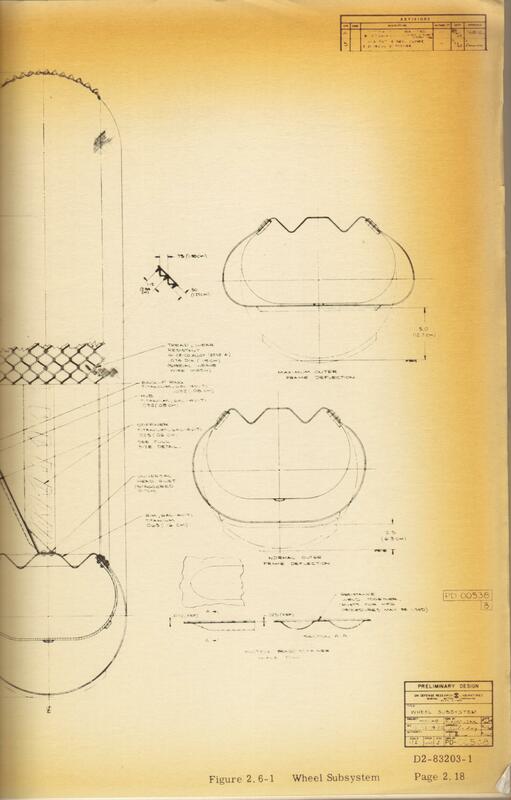 Additionally I am aware of Army mobility studies (from some of Dr M. G. Bekker’s work), where “balute or balloon” wheels were employed, circa mid-1950s, which were to be used in crossing water, swamps, or extremely volatile or friable soils. Pictures of these vehicles show wire-frame wheels, both with and without grousers. Although air-filled, these were not actually pressurized to any significant extent (some had open axle-holes to allow for exterior attachment to existing axles), and could have been air-vented for use on the moon. Simpler airless wheel designs go back to circa 1920-30s, where steel banded flex wheels were initiated for farm machinery and to improve buggy-ride. In the attached drawing, the earliest revisions were made Dec-1964, thus the wheel design was obviously being made in 1963 or before. This drawing was signed by these individuals, all but one of whom I know personally: Bev Hockaday, Arnold Rakowski, William Thomson, [unk?] Steffener, Frank Kostusak, Ferenc Pavlics, with one illegible signature. In this 120+page report, other drawings are additionally signed by L. Wilson. If anyone has contact with these individuals (if they are still alive) would you contact them and see if we can find some other similar materials, for a historical record. The earlier the material, the better. I have been made aware that there is group putting together a history of our company and its projects, dating back to 1948 and onward. I will help them with copies of any of my material, as something forms up.